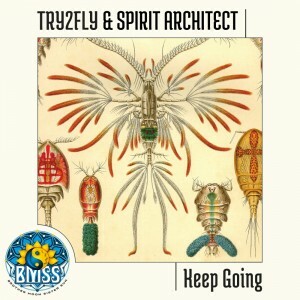 Spirit Architect and Try2Fly combine forces on a new release under the BMSS Records flag. Keep Going is a 144 BPM Full On roller-coaster crafted by two producers with a talent for uplifting Psytrance. With powerful G-Force and old school Goa Trance elements that give you extra air time, ride through this future classic at the speed of white lightning towards a blissful morning on the dancefloor. Mastered by Stryker Masterings (formerly XSI Masterings) and designed by Soraya Putra, this is the latest addition to our canon of impeccably crafted morning Psychedelic Trance.